The OFT has eventually released the long awaited compliance report about the payday lending sector. For those who have missed it, here is a summary of the report or you can go through the full report on the OFT’s website. While some of those who are unfamiliar with the sector might learn something from it, most of the people who are/were working in this industry will find it very poor or even uninteresting. Barely a few interesting numbers. This is a sad record since the OFT, who is supposed to be the organism that protects consumers and enforces new rules, does not even understand this market. The OFT was supposed to visit all the 50 lenders they were ‘investigating’. As far as I know, very few have actually been visited. Then, why only 50 of the main lenders? Those are supposed to be the ‘best’ since they have the most satisfied and faithful consumers. What about all the small ones who are really the ‘sharks’. Then what about the brokers? Why don’t they fall under the investigation and manage to escape most of the regulations? I will cover all those questions marks in the next paragraphs. Firstly, I will start with general considerations on the payday loans market. As most of you are aware, the market is regulated but is it really well regulated? I clearly do not reckon so. Regulations tackle topics that show a total misunderstanding of the product and the clients. For example, when advertising, lenders must display the Representative Example and their APR in certain cases. Customers are usually very much aware of the high amount of the APRs the lenders display. They usually do not understand it and, as most of the lenders argue, it does not reflect the actual nature of the product. It is a short-term product and clients usually look at the total cost they have to repay, not the APR. So why would the OFT ask the lenders to display their APR? Another example: you cannot advertise a payday loan to pay every needs such as buying food, leisure… However if you look at the reasons why people use payday loans (and the media has released many articles about that), it is clear that payday loans are indeed used for paying the rent, buying groceries, purchasing a nice holiday… Obviously this should not happen and this is not how payday loans should be used and people should find other solutions but are the lenders to blame for this? 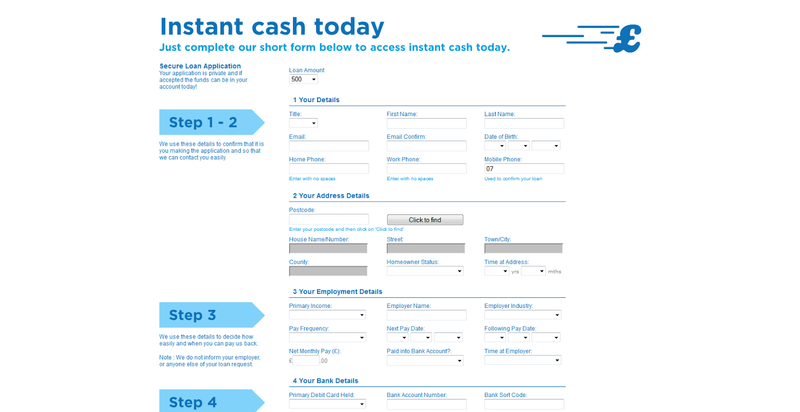 A payday loans is just another financial product, why is it not considered as such? Indeed, the product is available and very successful. Since 2009, the market has grown from a value of £900 million to more than £2 billion! Payday loans exist because there is a demand for it and simply because there is an actual issue in the society. It really makes me laugh to read such hypocrisy from the OFT report: ‘Lenders must ensure that borrowers understand what a rollover is’. Come on! Should they send someone to every applicant’s home to make them read the ‘how it works’ section or the loan agreement?! People are supposed to be responsible and read things before jumping into them… They simply don’t, so take it on-board and protect them from their stupidity! So, the goal of the OFT should be to protect those ‘silly people’ but it has to be done smartly. How is lending money from a payday lender different from taking a loan from a bank to buy a sofa or a TV set you actually cannot afford? There is no difference; both banks and lenders carry out financial checks, both lend money and expect to be paid back. Yes, there is one difference; banks will not give you any more money if you cannot pay back. In the case of payday loans, you can apply for another loan with another lender as they do not communicate with each other. Here is the problem! The payday loan should be accepted, exactly like another financial product and some official data should be built so lenders know and are able to make an informed decision (and should be forced to use it). The current credit scoring system is far from being perfect and should be either replaced or improved as not many lenders resort to it but instead would have their own credit scoring system. Are all Lenders to blame? One thing that should also be acknowledged is that most of the top lenders are actually doing a relatively good job. One easy way to verify this is to look at customer satisfaction. Just check out the Wongas and the likes in customers’ reviews to see that people are usually quite happy with the service. I actually used to work for one really responsible lender: we assessed the financial situation very thoroughly, we gave very small amounts at first (the 1st loan is where most people would default), we did not rollover any loan, we arranged repayment plans and cut all extra charges when necessary. 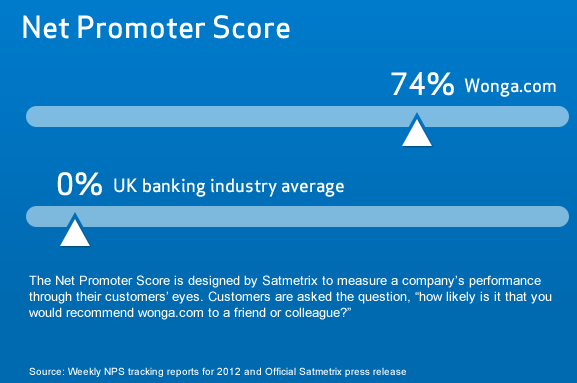 As a consequence we had an extremely low number of complaints received (merely a couple during a month for an active customer base of several hundred thousand clients), very satisfied customers (our NetPromoterScore was close to 70% when most banks are close to 0) and a profitable business. There are obviously borderline situations and improvements to be made for each lender but which industry does not face any issues? Have you never, ever, experienced any problem with your Internet provider? Have you never complained about an online purchase not received or received late? Most of the issues start when people cannot repay on time and when they are charges extra added to the original costs. But once again let’s face it, whose fault is it? You sign a contract to borrow X money and promise to repay in 10 days but you don’t… Lenders tell you from the beginning, if you know you will not be able to repay do not take out a loan. Whose responsibility is it, especially when the applications received are (they are in most of the cases) partly faked by increasing your salary here, decreasing your real charges there…? Lenders use those applications to assess the financial situation of the applicant to know whether or not they will be able to repay. If it’s manually improved (like you would do for your CV), how can you blame the lender who is actually the one taking the risk and lending money based on those lies? On the other hand, some lenders are far from being clean and this is exactly where the OFT should take action as soon as possible. You’ve all heard of rollovers, that’s one of the problems. 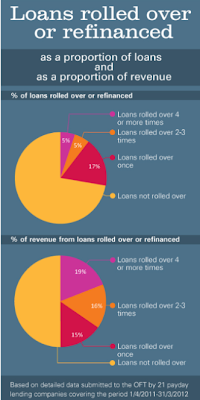 While clean lenders are happier when you repay on time (they make their profit and you can then take a second loan), some will make a lot of money when you are in financial trouble and cannot repay.If you look at the graph below, you notice that most of the loans are NOT rolled-over and around 30% are rolled-over. However those loans represent 50% of the revenues generated and this is intolerable. Let’s exclude the cases where people contact the lender and an arrangement is concluded to repay in a few days with no extra charges – that’s fine. No, I’m talking about cases where payday loans are rolled over 2,3,10 times… Yes that still exists. Even twice is too much. The OFT should simply ban rollovers. If you cannot repay, that means you have financial issues. So, you should be 1/ redirected to a Debt Charity such as StepChange 2/ have a realistic repayment plan arranged with no extra charges. At the same level of ’dirtiness’ are some brokers called pingtrees. 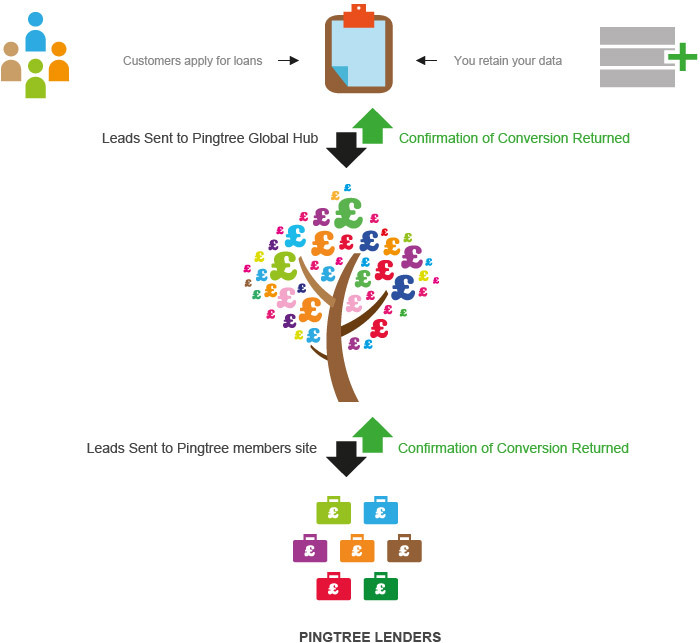 Pingtrees are aggregators who collect payday loan applications via a simple site (just Google ’payday loans’ and they will bloom on your page) and then in a few seconds propose your application to a panel of lenders. The application (called ’lead’) is first proposed to the highest bidders (each lender decides how much they pay depending on how fresh leads they want to see) who buys or declines the lead. If the first lender buys it, the client (who applied via his computer) is redirect to the lender’s website where he will have to fill in a few more fields to complete his application. If it is declined it goes to the second lender, and so on... until someone buys it. The lower you go in the pingtree, the lower the bid. This is not so different from insurance brokers for instance. Now the fun part. If none of the lenders accept the lead, the client (remember all this happens in a few seconds) might be proposed another offer via a banner for example. When we talk about ’other offer’ it is actually the same kind of offer but the pingtree only proposes you to click directly on the lender’s banner and they might receive some money for each click. Another way to monetise their data when just a few seconds ago they were told this client is not in a good financial situation since nobody accepted him... food for thought ! Another common practice is to resell the lead to... hold on... another pingtree ! Yeah ! Once again, all the lenders just replied’ NO NO NO this client is no good, he is in financial trouble’ and yet, it will be resold to another similar broker who will also take his application through his own pingtree and try to sell it. Who knows, someone might finally accept it and they will get some money out of it. And this goes on until the client is finally accepted or declined everywhere after being resold many many times. Oh, I forgot ! Some lenders also have their own pingtrees. Yes, because if you buy a bad lead from a pingtree, you might also want to make some money out of it. For example, you buy a lead from a pingtree at £40 but after completing the last fields of your application you finally decide to decline the client (maybe his credit card has expired or you have conducted additional checks...). That would mean you just lost £40. In a market where you would make in average £20 to £25 out of a £100 loan lent for 30 days (not deducting all the other charges: payroll...) that would take 2 loans repaid to make up for it. Obviously this is a huge loss and some lenders are also reselling those leads, re-injecting them into the cycle... Fun, isn’t it !? Obviously such practices MUST be banned and are not acceptable. Such clients should be taken out of the vicious circle of payday loans and simply be blacklisted (what my previous company used to do). Instead of putting most of the blame on payday lenders, the OFT should very actively look at the brokers who, and I’ve seen this an awful number of times, sometimes charge fees as high as £60 for a simple registration! So one piece of advice if you really really need to get a payday loan, go directly to a lender and avoid brokers. There are several issues but as a previous insider of this industry I don’t think the OFT is looking at the right places and have not identified all of them. - 2/ Forbid rollovers, no exceptions! If you cannot repay your current loan, you don’t pay it back with another loan! - 3/ Forbid to resell leads. For a pingtree, if no lender accepted the lead, it should be considered lost. For a lender, declines should also be considered lost until the client submits a new application (new job for example). Somehow this information should also be sent to debt charities. - 4/ Regulate extra charges after the payment date. If a payment is late, you can add only once a late penalty (a reasonable amount, to be defined, X% of the loan amount for instance) and then all interests are frozen and a repayment plan should be agreed. - 6/ Revoke the license of anyone who does not respect one of the rules above. I think this kind of rules might clean up quite well the market since those who currently make money out of people in financial trouble would no longer be able to do so. This applies to both lenders and brokers. If a lender does not conduct a proper assessment, it will end up with bad clients, bad debts and will go bankrupt. A lender who does its homework and lends money to people who can afford to pay back will have satisfied clients and a profitable business. As for brokers, those are simply intermediaries who found an interesting place to make business and too often abuse their position of simple relay between the client and the lender to reject all responsibilities. As a consequence, regulations should be enforced much more strictly for them.